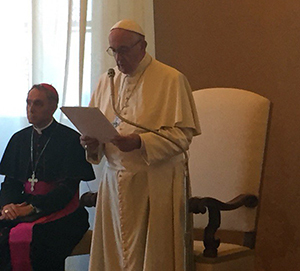 Members of the Fordham Law community attended a symposium on September 7 and 8 hosted by Pope Francis in Vatican City for the purpose of discussing interreligious cooperation toward the resolution of problems weighing on the nations of the Americas. Renata Dias, director of Fordham Law’s Institute on Religion, Law & Lawyer’s Work led members of Fordham’s Laudato Si study group in attending a symposium titled “The Americas in Dialogue: Our Common Home.” At the symposium, the pope led a congregation of interreligious attendees in a discussion of the predominant problems facing the American continent, including poverty, hunger, and environmental degradation. Attendees at the symposium, which was organized by the Institute for Interreligious Dialogue in Argentina along with the Organization for American States, discussed the founding of a continental Institute of Dialogue, which will bring together delegates from different faiths for the purpose of discussing continent-wide challenges. Professor Hussein Rashid, a delegate to the symposium and a member of Fordham’s Laudato si’ study group, presented at the conference the Fordham project and an interfaith perspective on Laudato si’.